Translated & adapted by A Taylor from an article by Richard Zimmerl; with enhancements from H Pollak. The end of the war in Austria was not a uniform process. While in Vienna the war ended in the middle of April 1945, fighting continued in the west and south, even while in Vienna the Second Republic was being created. 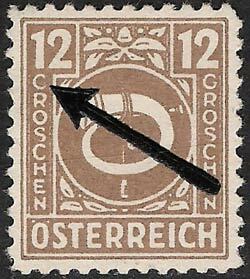 And while on 2 May 1945 the first stamps were being issued in Vienna (Hitler-heads with overprinted "Österreich"), Carinthia and Styria were still part of the German Reich. While the Soviets were interested in a quick re-establishment of the postal service and the postal operations were never fully interrupted, in the western zones the postal service was discontinued for several months. The postal employees were called back to duty, but for the time being were occupied mainly in repair work. Particular value was put on restoring the bureaucracy, and maximum value on order in the cash-box. 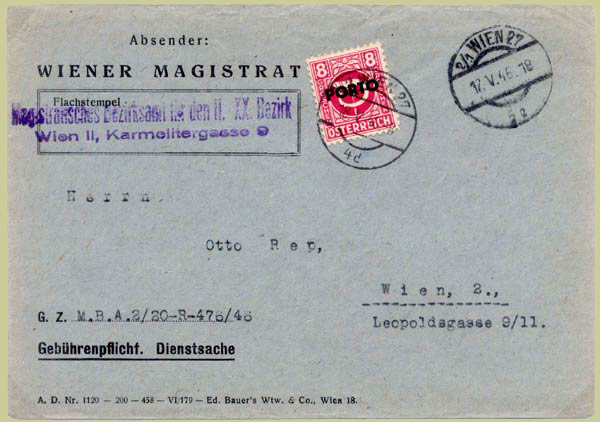 On 20th February 1945 the American Bureau of Printing & Engraving were instructed to prepare stamps for use in occupied Austria. The design was selected on 3rd March, and a die engraved by the 26th. 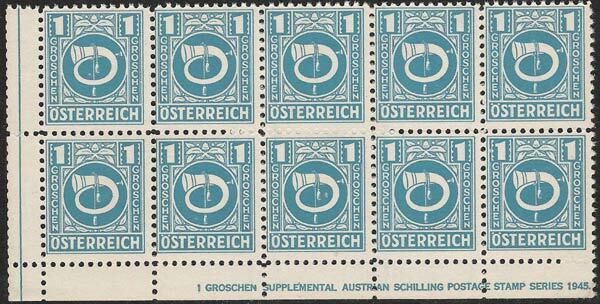 Printing was by offset litho; the finished stamps had arrived at Allied HQ by 23 May. The Americans also brought banknotes denominated in "Besatzungsschillinge" (Occupation Schillings). In the Post- and Telegraphenverordnungsblatt No. 7 chapter 18 of 21 May 1946, these stamps were meticulously if belatedly described: "All the values from 1g to 5S have the same design in colour on a white background, which is trimmed with simple leaf-shaped ornaments: a white Posthorn, which is entwined with a rope having tassels at its ends; in the upper left and right corners the figure of value on a dark background in white; descending from that in both margins is the denomination (GROSCHEN or SHILLING) and in the lower border the word ÖSTERREICH, all in white block capitals.". 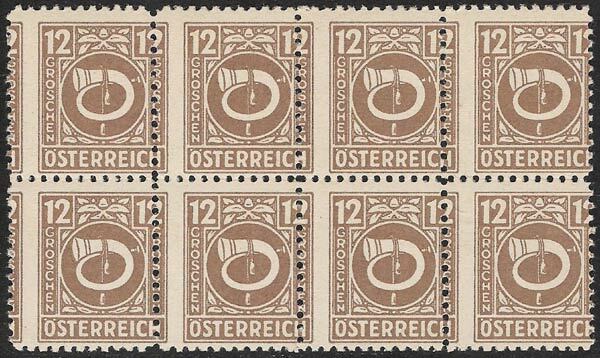 With the official reopening of the postal service in Salzburg on 28th June 1945, the 3, 5, 6, 8, 10, 12, 20, 25, 30, 40 and 60 groschen values were issued. 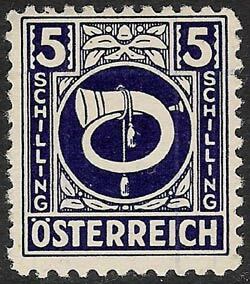 It is interesting that the stamps although denominated in shilling and groschen were however still paid for with the Reichsmark. On 15th July the 4 and 15 groschen followed, on 13th August the shilling values, and very late, on 20th November, a supplementary value of 1 groschen. 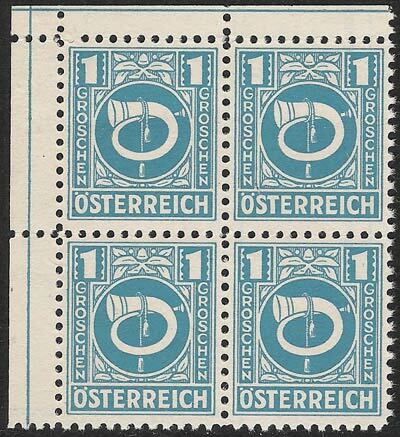 The stamps were valid only in the western zones of occupation; however they were also sold in Vienna to collectors, but only to those who also bought the RMark values of the Arms series. Occupation of the middle and western Mühlviertel was handed over from the Americans to the Russians in the period 24 July to 8 August, and usage there is very rare. At first there were insufficient of the Russian zone Arms-series stamps available, and the Posthorn stamps continued in use for some time. Mixed frankings are avidly sought; they were later also possible with the Landscapes series stamps. 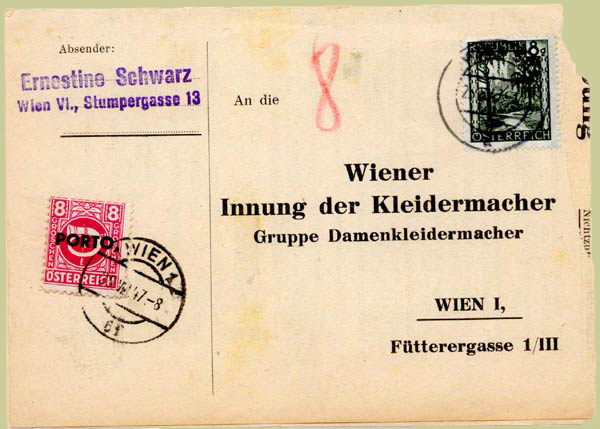 The highest printings were for the most commonly used values of 6 and 12 groschen for inland postcard and inland letter (in the other states of Austria there were fewer local letters compared with Vienna) with about 49 and 69 millions. The late-issued 1 groschen had the lowest printing, 3.2 million, and the shilling values also had printings barely over 3½ million each. For a full table see Krueger. Each counter-sheet had 100 stamps. The printed sheets consisted of 4 counter-sheets, separated by narrow gutters which were horizontal and vertical lines as well as short strokes in the corners as cutting guides. The cutting was evidently very inaccurate, so that the lines sometimes appear above, underneath, on the right or on the left of the stamps. 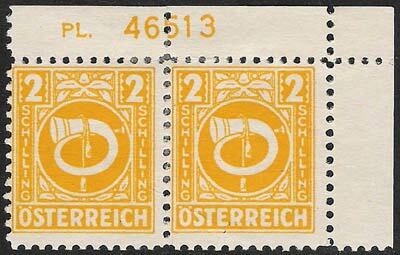 The sheets display one long single-line marginal inscription, begining about the middle of the second stamp: "(value) GROSCHEN ALLIED MILITARY POSTAGE STAMPS FOR AUSTRIA SERIES 1945". 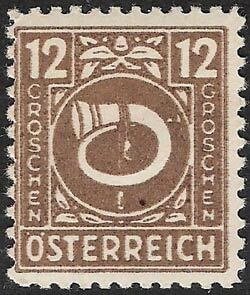 The late-issued 1 groschen value has a different inscription: "1 GROSCHEN SUPPLEMENTAL AUSTRIAN SCHILLING POSTAGE STAMP SERIES 1945". On the right above (or underneath, if badly cut) between the 9th and 10th stamps is a 5-digit plate number. The sequence of the plate numbers does not agree with the steps in value (see Krueger p6 for a list). 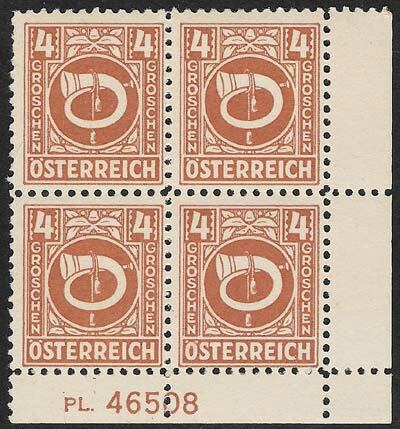 The 10 groschen value has the lowest plate number, 46494, and the highest is 46916 on the late-printed 1 groschen value. The stamps were manufactured by lithography. The printing was evidently done with great urgency and not very carefully! There are numerous plate faults, colour shades, and printing errors. See Krueger; also the Gindl "Posthornserie" catalogue of the "Interessengemeinschaft der Spezialsammler Österreichs". Left: one of the most popular plate faults is the "Posthorn without rope" found on the 10, 12 and 30 groschen values. Right: damaged "C" on left and "S" on both "GROSCHEN"s.
As well as countless coloured or white dots, strokes or rings are found. The perforation is as sloppy as the printing! (OK, there was a war on at the time.) The crude line perf 11 is not very precise, and is in many cases incomplete so that the "confetti" remains [a "dangling chad"! ], as can be seen on several of the illustrations. 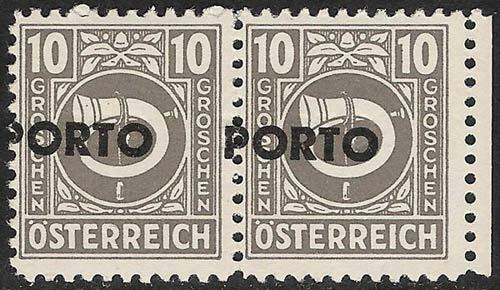 On this block of ten 1-groschen, many errors are immediately recognizable including the left-hand sheet cut through the first column of perfs of the adjacent pane; badly-centered perfs; blind perfs; white (= missing colour) splodges on three stamps; etc! 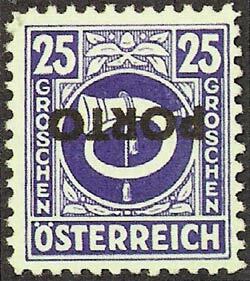 Misalignments are quite common, whereby the perforation extends over the design, in rare cases even going through the middle of the stamp. Since with line perforation the horizontal and the vertical perforation are done separately, either or both can be misaligned. After the issue of the Landscapes series began, the posthorn stamps were withdrawn from sales counters on 20 Nov 1945 (U S zone) and 21 Dec (British & French zones). They were however still valid for franking until 21st May 1946. 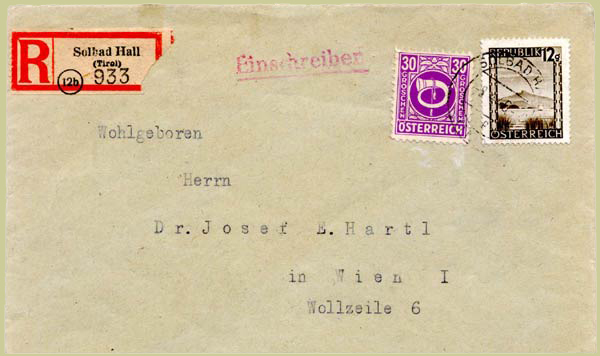 On that date, as Dr Kainz explained (Austria 133 p64), the key regulation was issued as BM.Zl.10/149/1946; it states that "with immediate effect the post horn series stamps are no longer valid for postage". As soon as a post office knew the content of this regulation or had a copy of it, it was required to immediately levy a surcharge on a letter bearing a post horn stamp. This is why some offices charge postage due before 31 May 1946 (the commonly-quoted end date). 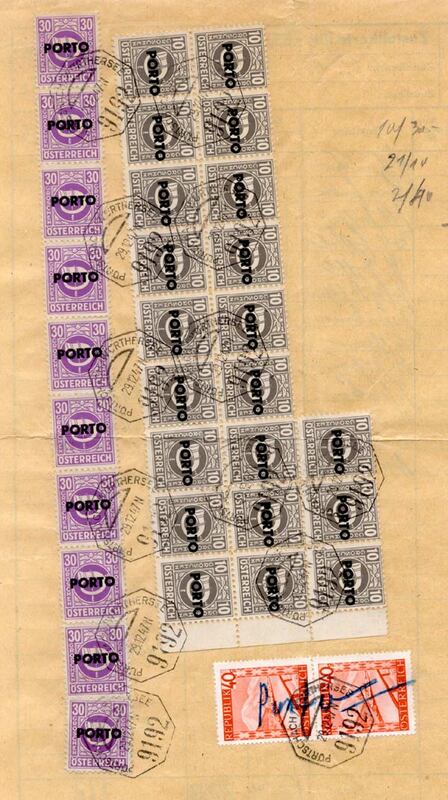 However, these stamps can be found used on internal Post Office forms as late as 1948. 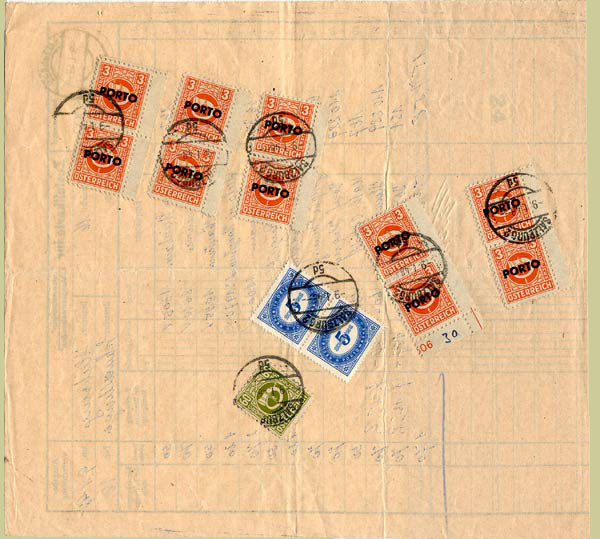 Unoverprinted 60 groschen Posthorn used alongside overprinted ones on a Zustellkarte, an internal Post Office form; cancelled 9 Jan 1948. The delivery fees on the other side came to 10.90 Schillings; 2x5S + 60g + 10x3g = 10.90. Solbad Hall in Tirol to Vienna. Mixed franking with landscape issue. 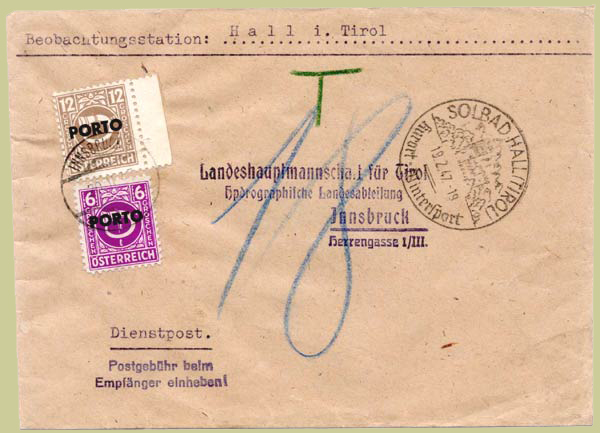 8 April 1946; letter rate 12g + registration fee 30g. 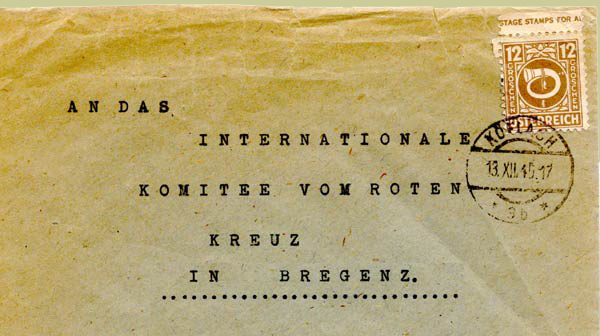 German-style registration label. 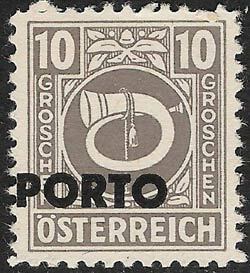 All values (except the 1 and 4 groschen) were issued in 1946 with the horizontal imprint "PORTO" for use as postage dues. These stamps are an Eldorado for plate-fault collectors. Naturally, all the plate faults of the original stamps also occur on the postage dues; in addition very many errors occur in the overprint. Especially expensive are inverted, double, and displaced overprints. Very frequent errors, which occur in all values, are the "thin first O" and the "flat-bottomed second O". Damaged letters often occur. One finds extra bars caused by overinking around the typeface; part- or wholly-filled-in letters caused by dirt; and missing parts of letters caused by damaged type. Such pieces are very attractive to collectors!. 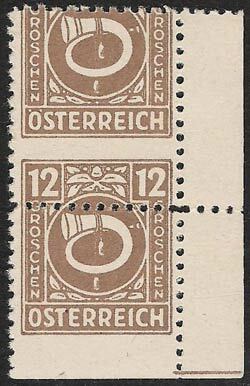 While the stamps of the posthorn series were withdrawn on 20th December 1945 and were invalidated by 1st June 1946, the postage dues remained valid until 7th January 1948, and of course in the whole of Austria. Large Zustellkarte dated 29 Dec 1947. 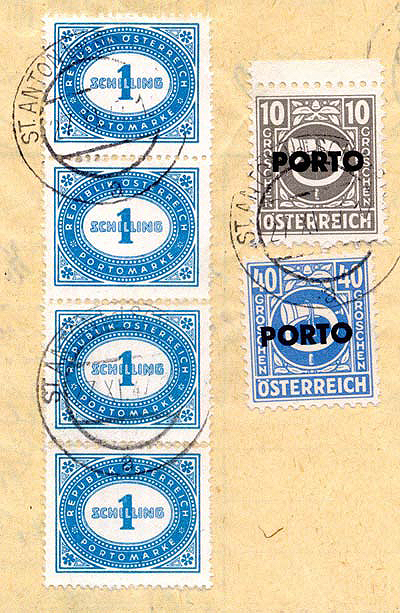 Note landscape stamps with handwritten Porto used as dues. (part of the back of a) Zustellkarte dated 27 Nov 1947. Cancelled 25/7/1947. Treated as underpaid local letter for which the rate was 12g; franked 8g; charged double-deficiency = 8g. Cancelled 19/2/1947. Inland letter rate 18g; official letter for which the recipient had to pay. Cancelled 18/5/1946. Local letter rate 8g; official letter for which the recipient had to pay. 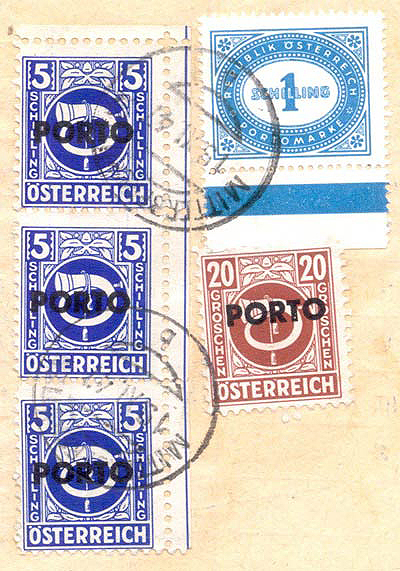 Mixed Porto and Russian-zone franking. Cancelled 5/9/1946. Official letter for which the recipient had to pay the local letter rate of 8g. An article by the late Dr Christine Kainz in Arbeitsgemeinschaft Österreich e.V's Rundbrief Nr. 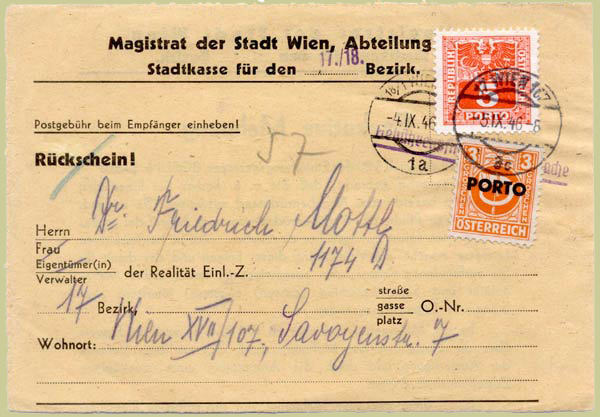 52 cleared up the uncertainties over the withdrawal date of the Posthorn Series (ANK697-713) brought to Austria by the Allies, and the subsequent levying of postage dues on items franked with them in the period 21 May - early June 1946. The PuTVB is to be interpreted thus: The relevant regulation dated 21st May 1946 as adopted states that "with immediate effect the post horn series stamps are no longer valid for postage". As soon as a post office knew the content of this regulation and/or had a copy of it (it could have been distributed by fax), it was required to immediately levy a surcharge on a letter bearing a post horn stamp. This is why some offices charge postage due before 31 May 1946.